Quality Laminate Flooring Warehouse overstock items, special runs & discontinued products in stock at 30-70% Off. High quality Laminate flooring manufacturers: Quickstep, Mohawk, Shaw and more. Oak, Cherry, Walnut, Hickory, Maple and all major species looks in wide or narrow planks. A variety of textures are available from smooth to textured providing a realistic look and feel. Over 1,000,000 square feet of quality flooring in stock: carpet, hardwood, laminate, sheet vinyl, luxury vinyl plank, and transition and moldings. There are many reasons why hardwood flooring continues to be so popular. The main reasons are the durability and ease of installation of laminate flooring. 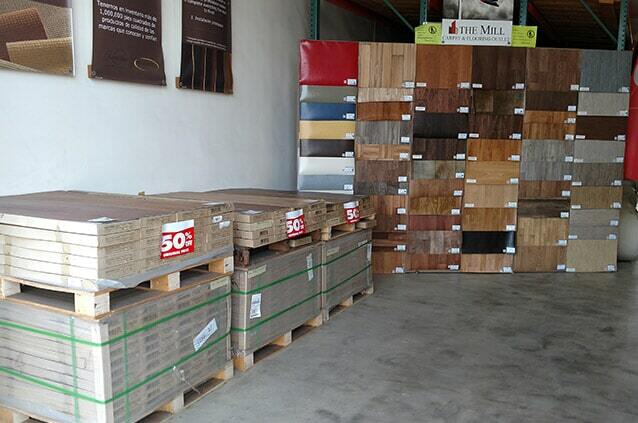 At The Mill Carpet & Flooring Outlet, we know that you want durable, beautiful laminate flooring at wholesale prices. Laminate floors are manufactured by overlaying an image to medium or high density fiber board (HDF) cores. A wear layer and balancing layer of aluminum oxide and melamine resins protect the surface and provide exceptional durability. Laminate flooring is more scratch resistant than hardwood flooring providing a practical alternative for active households. In addition, laminate flooring is less expensive than hardwood flooring and never needs to be recoated or refinished. Laminate flooring can be installed in basements and below grade and is less expensive than hardwood flooring. Laminate floors are easy to clean and maintain by sweeping, vacuuming and occasionally damp mopping. With proper care laminate floors can last for years to come.